Seldom do we come into full surrender without a fairly high level of pressure. Sometimes we have to be left with no alternative except for things to get worse. At some point we have to activate faith in order to come into that forceful River of Life that in and of itself feels threatening to the self that we know. In this image the seeker has just come from a ravine where a river usually runs deep and strong. There is a call to the Tree of Life, but it seems upstream for us. To the amazement of the one who is surrendered that the River of Life does not take away their choice. The River opens up just before the steps of the pilgrim allowing the pilgrim to go at his/her own pace. He/she feels the power of the River, yet it is using that power to provide choice of timing. Flanked at the side of the pilgrim walking upriver to the Tree of Life (more of Jesus) are Ruah ha Kodesh (Holy Spirit) and El Shaddai (God of abundant provision). 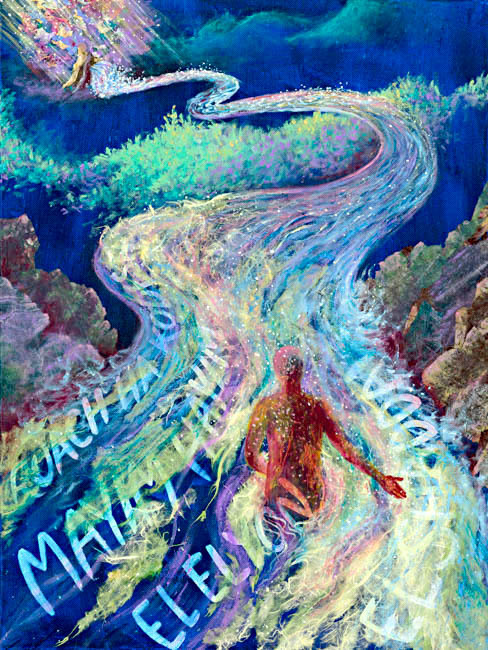 Mayim Hayim means Living Water. Behind the pilgrim as if the Voice behind saying “this is the way; walk in it” is El Elyon (the Most High God).